Once you have received a down payment, or at least a signed contract, you will officially move into the pre-production phase of the project. At this point, you are going to take your written proposal, and expand it into a full project map, where the timeline / milestone dates, client responsibilities, locations, script, necessary equipment rentals, and any crew help are solidified 100%. It’s very important that you set realistic expectations for the timeline, and to complete all the important aspects of pre-production. If you do not give yourself and the client enough time to adequately prepare, it can prove disastrous to your project and reputation. The client will be looking to you to provide leadership through the pre-production process, so open communication is very important here. I prefer daily or every other day emails, and phone calls weekly to ensure everyone is staying on the same page. It’s also important in the pre-production phase to identify who the shot callers are that you’re working for. If it’s corporate video, it could be multiple people that you will need to make happy. Try to identify any combative personalities, or potential pitfalls as soon as possible. Deal with any obstacles professionally, but firmly. Let the client know that you are in charge of the project, and that is why they have hired you. The more extensive your planning and documentation of the project, the more the client will feel comfortable with you leading them. I touched briefly on the most important aspects of pre-production above, and now I will go more deeply into each subject. The project timeline is one of the most important documents that needs to be created during pre-production. It will list all of the important dates of the project, including: the start of pre-production; when the script will be reviewed and finalized; when the locations will be reviewed and chosen by; when your production dates will be; when you will wrap production by; when the editing process will start; when you will deliver the first client proof to view; and the expected project completion date. It’s very important that the client understands their responsibilities. The difference between you paying for hair and makeup and the client paying for hair and makeup could be whether or not the job is profitable. Make sure every detail of the project is secured, and that everyone clearly knows what their expectations are. Make sure that all of the dates are very clear as well, many business owners are very busy, and may require you to check in regularly to ensure progress is being made. For this project, I communicated frequently, and took the client’s basic written script and turned it into a video treatment which included opening sequence, introductions, b-roll suggestions, interviews with their text/script, closing call to action, and end credits. Acquiring a perfect location for your shoot will add immediate production value. It’s one of the most important aspects of your shoot, and it could vary from a simple black or gray backdrop for an interview in your studio, to an on-location setup with intricate lighting. Set design may be necessary as well, where creating the ideal look and feel for your clients based on their business is important. You can often acquire locations for free, as long as you give a credit to the location. When reviewing locations, take detailed notes on lighting and audio concerns, and create a lighting diagram that shows any practical lights, windows, doors, or other sources of light. Envision yourself shooting at the location, and where you will setup. Look for areas to shoot B-Roll in as well: you can never have too much B-Roll. In this project, the clients acquired access to a luxury home demo site, which perfectly matched their desired brand image. See the next page for the full location review notes for this project. Early on in the project, it has to be determined who will be writing the script, what level of script review you will provide, and who will have final say over the treatment of the video. It’s important to communicate on the desired effect of the video, specifically as it relates to their target audience. Make sure you and the client are on the same page before the scriptwriting begins. Should it be fun or playful, or upscale and elegant? For our project, the client was responsible for writing their own script, which I was to take and create a full treatment from. I created a script breakdown, with anticipated run-time for each section. There were multiple clients for this video, so it was important to balance the screen time for both of them, per their agreement. I had a rough outline of B-Roll shots that would be needed, as well as all of the interview material I would need. Once you’ve reviewed your location, and finalized your script, you can come up with an equipment list. I typically will include all of the items needed I already own, and then the items needed that I have to rent in two separate lists. 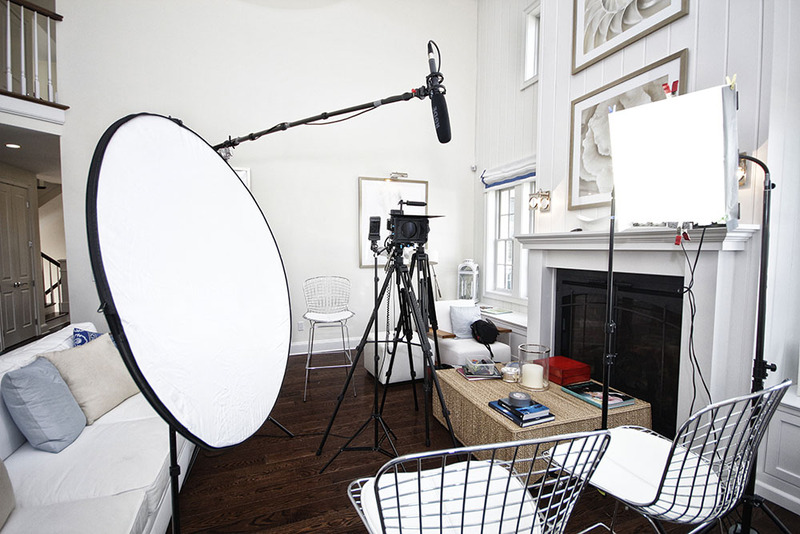 When choosing rentals, this is a great opportunity to utilize some higher end gear on your project and create something really incredible. Don’t be afraid to rent a good camera + lens combo, as it will add a lot of value to your project. I like to keep equipment rentals to under 25% of the project budget. For this job, I didn’t require any equipment rentals, but they will often be a regular part of most projects. Now that you know all of your equipment you’ll need, where you’ll be shooting, and what the treatment will be, you can determine how many people you will need to complete the job during production. If there are interviews, think about having a b-camera operator that can utilize a second camera if possible. Also, if you are not near-expert level or above, then I recommend hiring a location sound mixer. Utilize a boom mount arm when possible, as it makes stationary interviews much easier if all you have is a shotgun mic. At a minimum, you should have at least one other person who is moderately or well versed in using all of the equipment, and if possible, a dedicated second camera operator and location sound mixer. For this project, we were doing easy setups, so I utilized only one production assistant, who helped out in all regards, including setting up lighting, sound, grip and camera gear.